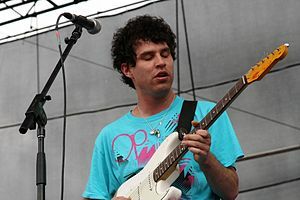 David Michael Portner (born April 24, 1979), also known by his moniker Avey Tare, is a musician and songwriter who co-founded the American experimental pop band Animal Collective. He has released three solo albums, as well as three collaborative albums with Panda Bear (Noah Lennox) which were later retroactively classified under Animal Collective's discography. After high school, Portner and Weitz moved to New York City to attend New York University and Columbia University, respectively. Lennox and Dibb eventually moved to New York City, and the band became more collaborative in nature. They finally settled on the name "Animal Collective". Although the band's output is, as their name suggests, a collaborative effort, with no typical 'frontman,' Portner has been cited by the other members as being the 'primary songwriter' and de facto leader of the group. For the band's Centipede Hz, Tare confirmed that the album has eight songs penned by him. Portner's other projects and releases include Terrestrial Tones with Eric Copeland of Black Dice, a split 12" with David Grubbs, and an LP with his then-wife Kristín Anna Valtýsdóttir (aka Kría Brekkan) called Pullhair Rubeye. He released his debut solo album "Down There" on October 26, 2010. David's sister is Abby Portner, Los Angeles artist and experimental musician, who creates some of Animal Collective's artwork and stage design. From 2006 to 2008, Portner was married to musician Kría Brekkan. Afterwards he was in a relationship with Angel Deradoorian and moved to Los Angeles with her. In an interview with Brightest Young Things, he implied that he has synesthesia and associates sound with visuals. He later clarified that although he has talked about it a lot in interviews he in fact does not have synesthesia. ^ Zisser, David (April 1, 2014). "Guitarist Avey Tare dabbles in Slasher Flicks". The Temple News. Retrieved November 9, 2014. ^ Thomas, Fred (n.d.). "Avey Tare". Billboard. ^ Fitzmaurice, Larry (May 17, 2012). "Update Animal Colletive by Larry Fitzmaurice". Pitchfork.com. Retrieved 2017-07-10. ^ "Animal Collective's Avey Tare to Release First Solo Album". Pitchfork.com. Retrieved 2017-07-10. ^ "Animal Collective's Avey Tare forms Slasher Flicks, announces tour dates - Consequence of Sound". Consequence of Sound. ^ Jeremy Gordon (2014-06-24). "Avey Tare's Slasher Flicks Announce Tour". Pitchfork.com. Retrieved 2017-07-10. ^ "An Artwork History of Animal Collective via Abby Portner Part One" Archived 2016-02-05 at the Wayback Machine, Field Day London Blog, London, 8 May 2013. Retrieved on 19 June 2013. ^ "Kria Brekkan", La Blogotheque, 5 December 2006. Retrieved on 13 July 2014. ^ "THE SELF-TITLED INTERVIEW: Avey Tare of Animal Collective", Self-Titled Mag, 19 October 2010. Retrieved on 13 July 2014. ^ "ARTIST OF THE MONTH: Deradoorian". Retrieved 2015-10-30.